Need or want a storm door? Many homes have screen doors but most of them provide minimal security if any and most are made of lightweight materials that do not offer much strength. In addition, screen doors do nothing for the homes ability to efficiently retain the heating or cooling within the house. If you would like additional security and heating & cooling efficiency then it is time to upgrade you storm door. A storm door is made of heavy grade metal and has stronger hardware that adds security to your home. Since the door is so much stronger than traditional screen doors, it does a better job of retaining the heat and cool air within the house. If you already have a storm door but need to repair or upgrade the hardware then you can call us too. Amboy locksmith provides all your service needs for storm doors. 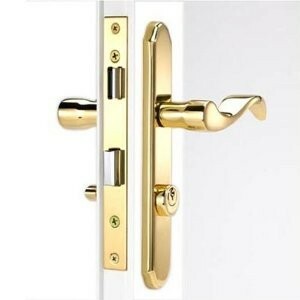 We carry a large line of hardware for added security. Call today for a quote on installation or repair.